After years of false rumors and abandoned hopes, the day has finally come. Verizon Wireless is finally getting the Apple iPhone! No longer does AT&T monopolize the iPhone market. 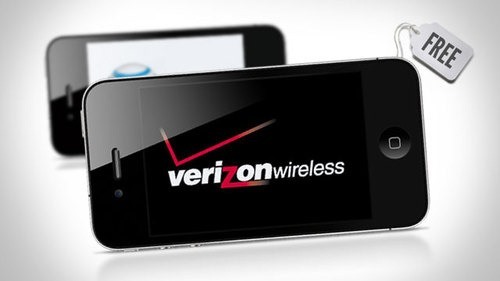 Three weeks ago, Verizon Wireless and Apple announced the iPhone 4's arrival to the nation's most reliable wireless voice and 3G data network. 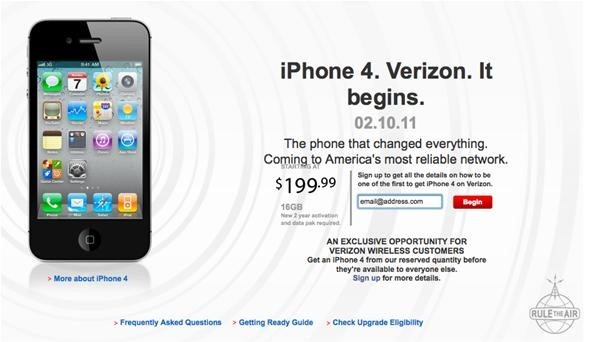 All current and future Verizon Wireless customers can get their hands on the iPhone 4 in February. 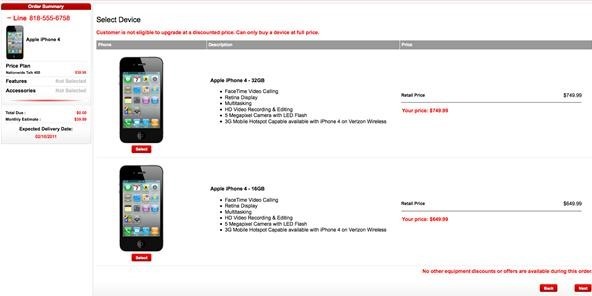 If you want the Verizon iPhone, don't waste time! Hurry up and join the pre-order waiting list. 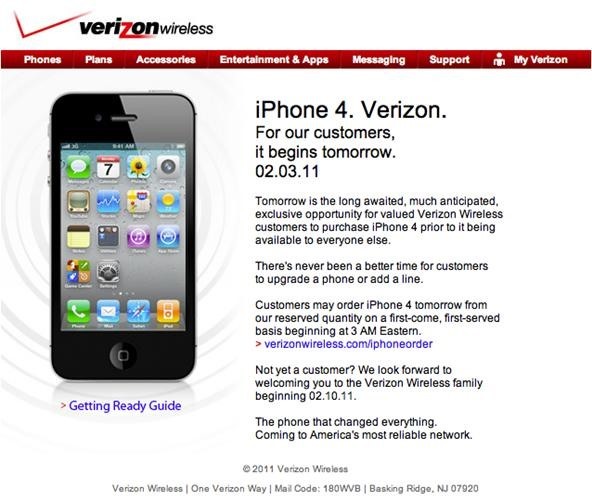 Starting today, all current Verizon customers can start ordering their iPhone 4s at Verizon. Immediately below are the instructions for starting and completing the order. 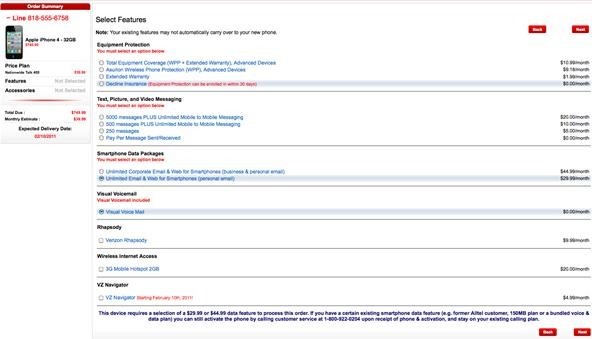 If you're not a current Verizon customer— scroll down to the original instructions on signing up for emails alerts from Verizon on when you can get your hands on the Verizon iPhone 4 (February 10th). Hopefully going through the whole process will help you determine if the iPhone 4 on Verizon is right for you— more specifically, if the cost is justified. If you're a current customer and signed up for the email alerts, check your inbox and you'll find a message like this one, with a link to the website for ordering. If you didn't sign up, you can go directly to verizonwireless.com/iphoneorder. Once you've gone to verizonwireless.com/iphoneorder, you'll see a start screen. Press Start My Order. If you already ordered, you can click on Check Order Status to see what's up with your order. Since this applies to only current customers, you'll need to log in with your current login information. You're going to pay $649.99 (16GB) or $749.99 (32GB) for a new iPhone 4. For this demonstration, I choose the most expensive one— the 32GB. Surprisingly, the data plans haven't changed, which is a good thing for Verizon customers— your bill will be about the same each month, given you select the same features as before. But in the below picture, you can see what everything costs. You can determine whether or not each feature is worth the price. 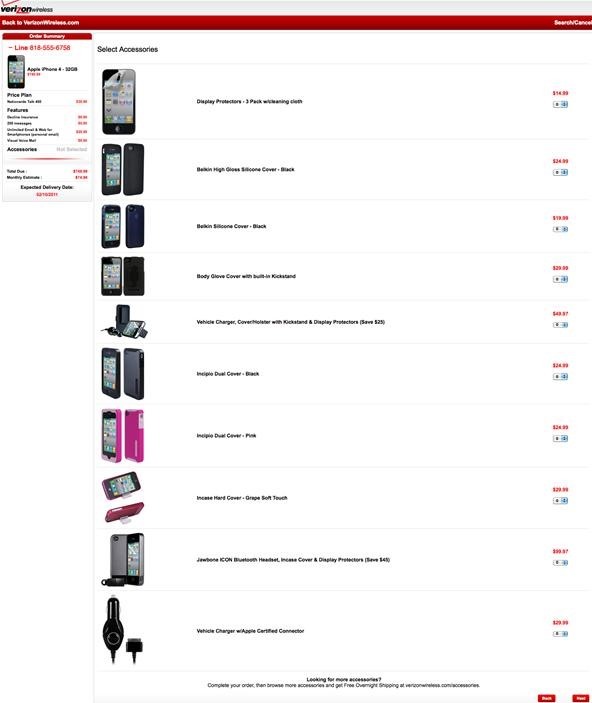 If you need an iPhone 4 case, this is where you can select it. There's not many options here, so it's probably best to wait and buy in person, so you can actually get hands on it before you buy. And if you have an iPod car charger, maybe try waiting to see if it works before buying an iPhone 4 specific version. Chances are you'll need to. Now you get into the usual online ordering stuff— entering your billing and shipping info. This is self-explanatory (hopefully). Now you're ready to check out. 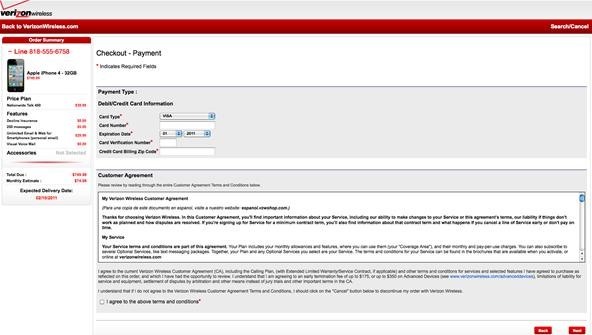 Just enter in your payment info and agree to the terms and conditions and you're almost done. Now you're ready to verify your order and see how much you're going to get billed. As you can see in the picture below, I'm paying a serious amount of money for this new iPhone 4. With taxes and fees, my iPhone 4 came out to $823.11!!! For some of you, that's just way too much to pay for a phone. My $74.98 in monthly fees is about what I pay now, so that's no problem. But $823.11!?! Hey, if you can afford it, why not? Once you press the Submit button, you'll receive a confirmation code and an email confirmation. 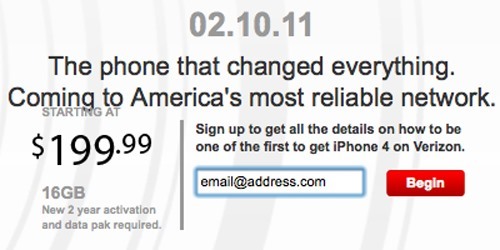 And as you can see in the image above, the delivery date won't be until 02/10/2011, which is the exact date the iPhone 4 becomes available for non-existing Verizon customers. You can cancel your order anytime. Play around with the features, plans and extras to see what you can afford. But once you hit the Submit button the Order Review page, it's a done deal. 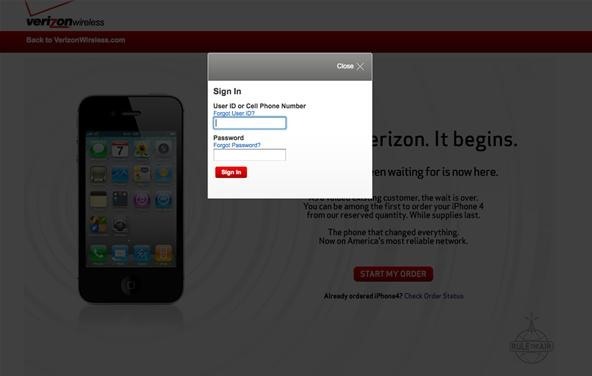 Below are the original instructions for signing up for the email alerts on when you can order your Verizon iPhone 4. To get started with your pre-order, visit Verizon Wireless. 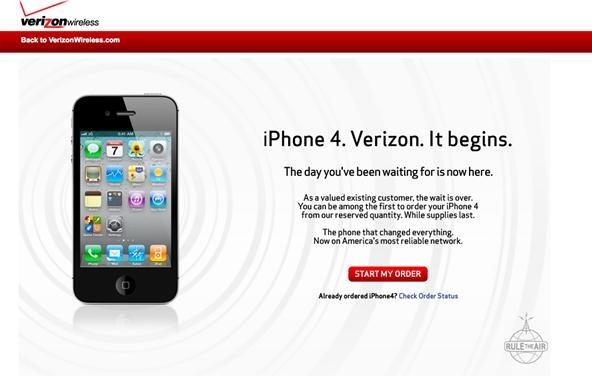 If you're a current Verizon customer, you can order your iPhone 4 NOW! If not, the dates have changed for the better for all of you non-Verizon users. The new date for orders online is 02/09/11. The 02/10/11 date now applies to in-store availability. 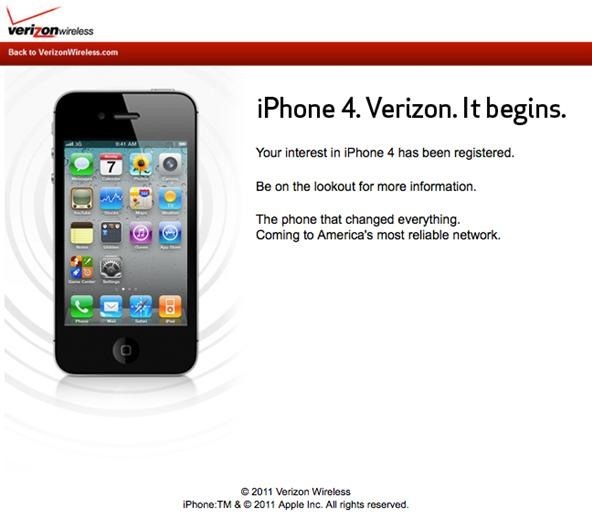 If you're not a Verizon Wireless customer already, just enter your EMAIL ADDRESS in the TEXT BOX and press BEGIN to sign up for all the details on how to be one of the first to get the iPhone 4 on Verizon. Whether you entered your email address in the text box and clicked begin or just clicked on the sign up link, it takes you to the same web form. As said above, both methods outlined above take you to the same web form, where you need to provide your EMAIL ADDRESS, FULL NAME, MOBILE NUMBER and answer a few questions about whether you're a current Verizon Wireless customer or already own an iPhone. Now the annoying part— waiting. Once you've submitted the web form, you just have to wait for Verizon Wireless to send you information at the end of January or beginning of February. But if you're a Verizon Wireless customer who's been waiting for the iPhone, another month won't kill you! 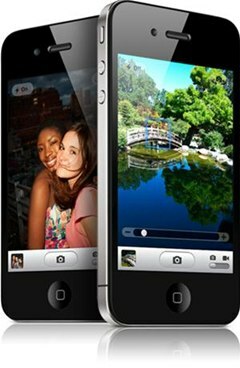 iPhone 4 is the most innovative phone in the world, featuring Apple's stunning Retina display, the highest resolution display ever built into a phone resulting in super crisp text, images and video, and FaceTime, which makes video calling a reality. iPhone 4 on Verizon Wireless will also include new Personal Hotspot capabilities allowing customers to use iPhone 4 to connect up to five Wi-Fi enabled devices. "We are pleased to introduce millions of wireless users to the industry leading iPhone 4 on the nation's most reliable network," said Lowell McAdam, president and chief operating officer of Verizon. "This is an important step for the industry as two great companies join forces to give wireless customers one of the most important technological additions to the mobile landscape this century." "Verizon Wireless customers have told us they can't wait to get their hands on iPhone 4, and we think they are going to love it," said Tim Cook, Apple's chief operating officer. "We have enormous respect for the company Verizon has built and the loyalty they have earned from their customers." iPhone 4 features a 5 megapixel camera with LED flash, HD video recording, Apple's A4 chip, a 3-axis gyro and a beautiful glass and stainless steel design like no other mobile phone. iPhone 4 also comes with iOS 4, the world's most advanced mobile operating system, which includes multitasking, folders, Game Center, AirPlay and AirPrint wireless printing. iPhone 4 customers have access to the world's most popular App Store with more than 300,000 apps available in an incredible range of 20 categories, including games, business, news, sports, health and reference. For more information on the Verizon iPhone 4, click here. For FAQs about the Verizon iPhone 4, click here. To learn how to get ready for the iPhone 4 (for existing Verizon Wireless customers), click here. To learn how to get ready for the iPhone 4 (for new Verizon Wireless customers), click here. To learn how existing iPhone users can switch to Verizon Wireless, click here. 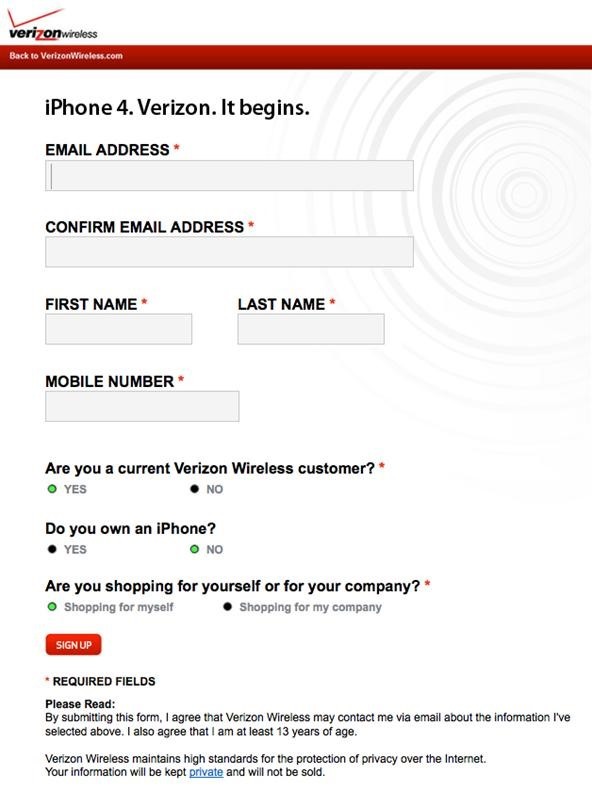 For existing Verizon Wireless users, click here to see if you're eligible for an iPhone 4 upgrade. Well, I ordered 3 for our family yesterday but on the upgrade eligibility prices. Whew. I don't think I could do even one at the full price right now. What gets me is the data pkg though. I think it's pretty expensive when looking at it being an additional monthly charge - for three phones. I think they should allow a smaller measured data pkg, especially since iPhone has its own WiFi too. Oh well. Hey, is that your phone number in the screen shots? Maybe not such a good idea? Haha— no, that's a fake phone number, not my real phone number. It's one of those fake 555 ones. And yes— I agree, there could be more options for the data package! They have data packages that are less but don't make them available for the iPhone. If the iPhone didn't have its own WiFi then I guess I could understand making people get the unlimited package.